In this blog article we evaluate how Fairtex gloves performed in reviews in search of the “Best Muay Thai Gloves in 2017”. Kicking off 2018, we enter a year full of new opportunities and we all decide and focus on our new year’s resolutions. What are some of the resolutions you have made? Would you like to exercise a bit more? Perhaps also take better care of your health and safety? Practising Muay Thai can be the way! And while you do it, use the best gear to keep you safe. Before rushing into the new year to chase our newly set goals, let’s also take some time to reflect on past year’s achievements and learn valuable lessons. In this blog article we evaluate how Fairtex gloves performed in reviews in search of the “Best Muay Thai Gloves in 2017”. A simple search engine query provides many interesting articles on the subject. Even though quite some forums are affiliated with online retails platforms, the reviews look genuine and based on user-experience. Here is a summary of what some of them had to say. The most reviewed Fairtex product is by far the BGV1 Universal Pro Fight Gloves. This is not unexpected, while BGV1 is the most popular the classic series of Fairtex Muay Thai gloves. In the article “Best Muay Thai Gloves Reviewed and Tested in 2018” on Fighting Report, it is described that the deciding factors of the ranking are based on durability (how long the product lasts) and comfort (how the gloves feel like). In the ranking of “5 Best Muay Thai Gloves”, the Fairtex BGV1 Universal Pro Fight Gloves are listed as No. 1 with Editor’s choice. It is described as having a good combination of durability and comfort, due to being hand-made from premium leather, with high stitching quality and a solid padding. Below a screenshot from their Pro’s and Con. In the final article “Ultimate Guide to the Best Muay Thai Gloves (2017 Edition)”, written by Muay Thai Pros, the Fairtex BGV1 Gloves are listed at #1, acclaiming it as “the best Muay Thai glove – period”, based on the following evaluation criteria: material quality, comfort, padding, design, durability and price. It is stated that these are the gloves to buy, if you only buy one pair. Similar to other articles, this review also described how the smaller yet dense design make it easier to hit pads and make them better for sparring. The BGV1 Universal Pro Fight Gloves are still very popular and much-loves as all round Muay Thai gloves. Whereas in several reviews we read that users prefer the “Tight-Fit” design for a compact feeling during pad work and sparring, others will list that feature as a Con. For example, as described by Fight Gear Geeks while ranking them in “The 5 Best Muay Thai Gloves”, a remark described that they found that the gloves required some time to break in, as most good gloves do. For people who would like to get a comfortable feel, right away from the first use, we can recommend the new series BGV14 Improved Fight Gloves. One aspect of this new design in particular is an improved fitting. Because of this, the BGV14 series is especially popular with beginners, women and children. We look forward to seeing reviews of the BGV14 Improved Fight Gloves during 2018. 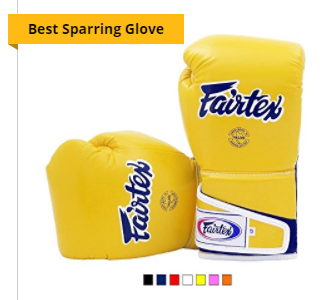 In the article by Muay Thai Pros, there is a specific subsection dedicated to finding “The Best ‘Sparring’ Muay Thai Glove”. Important factors for sparring gloves are: weight, size and shape. The BGV6 Stylish Angular Sparring Gloves is their top pick, mainly because of the good punching dynamic when sparring and the extra padding. The BGV6 Stylish Angular Sparring Gloves are also mentioned in the review by Goodbye Ninja, describing them as “perfect for sparring”, while they feel aerodynamic and make punching easier due to the angular design. The classic series BGV1 Universal Pro Fight Gloves have proven themselves during the years and are revered in online reviews. Why not get your pair today? Yet, as the industry’s innovator, Fairtex keeps developing new enhancements. Prefer gloves that are easy to break in? Then take a look at the new series BGV14 Improved Fight Gloves. We would love to hear your feedback! 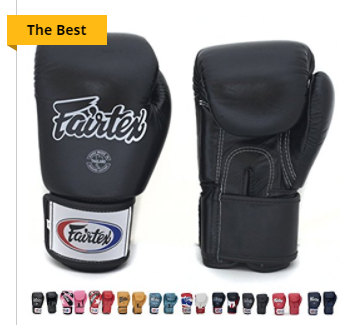 Of course, for advanced fighters performing a lot of sparring, you will be best served with Fairtex Sparring Gloves.